The Debate Club at Omega has been christened TANDEM, which means to act in conjunction. The members of this club are constituted by students of Grades VII to XII who believe in the objective that debating helps to develop essential critical thinking skills – the ability to make reasoned and well thought out arguments in addition to questioning the evidence behind a particular stance or conclusion. Critical thinking help students become curious about new ideas while also retaining a level of scepticism and building a healthy attitude to questioning. While the members meet through the year to develop their debating skills, students also attend sessions by experts to help their cause. The entire year’s activities culminate in the annual Inter-school Debating Competition. 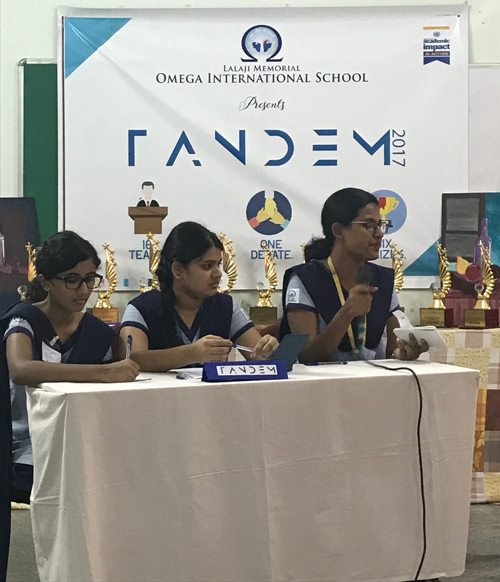 The competition is conceived entirely by the students of classes XI and XII of CIS and IBDP and involves them to understand the need for collaborative efforts to achieve goals. Various logistics starting with the designing of the logo, certificates, banner to selection of the topics and formulating the budget are all done by the students themselves; thereby improving their skills for the future and instils confidence to lead events of greater magnitude. The annual competition held in 2017 focussed about creating awareness about the 17 Sustainable Development Goals. This maiden initiative was a huge success in achieving its goal of bringing people together and equipping them with necessary skills like critical thinking, discussion, debate, collaboration and research and planning to solve local and global problems creatively.